Social networking (websites such as facebook, twitter, bebo, myspace etc) is here to stay and many businesses chose to have a policy on what behaviour and usage is acceptable including the content of what is shared if connected with the business name. Being mute on the subject leaves the Employer with little grounds on which to act if it becomes a problem in or out of the workplace. 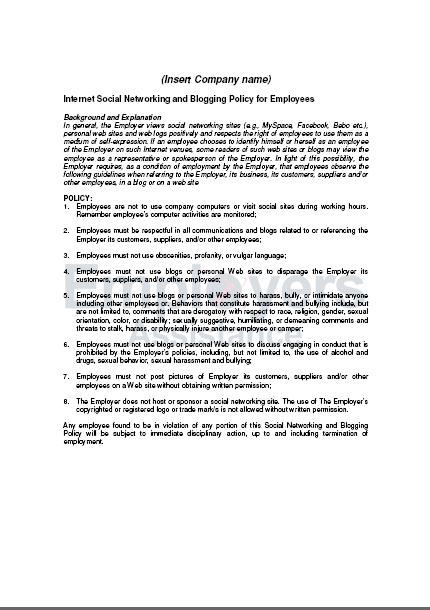 This social networking policy is intended as a template from which to develop your preferences as an Employer to control the usage and content of Employee's social networking behaviour. "..It's great as an employer to have someone on our side and well worth every penny.."